The book 'Medical Ethics III Ayurveda' written by a well known authoress Dr. P.V. 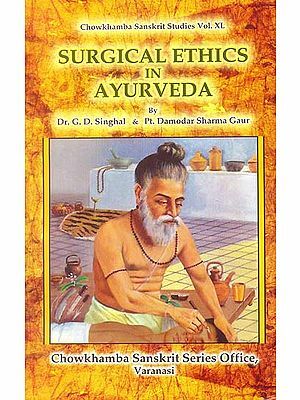 Tewari is probably the first book on the subject, dealing with all aspects of ethics; earlier written one book discusses only surgical ethics of ayurveda. In ayurvedic classics medical and social ethics etc. all are very intricately interwoven with each other, to separate them becomes difficult. Yet sincere effort has been made to present different aspects of medical ethics under specific chapters. Over lapping though present, yet is minimal, as it was unavoidable in order to present complete picture of the subject. Subject matter and discussions are strictly maintained within the framework of description available in ayurvedic classics and to autheaticate the statements relevant references from the classics are recapitulated, which will also facilitate the readers to form their own openion without searching the ayurvedic classics. 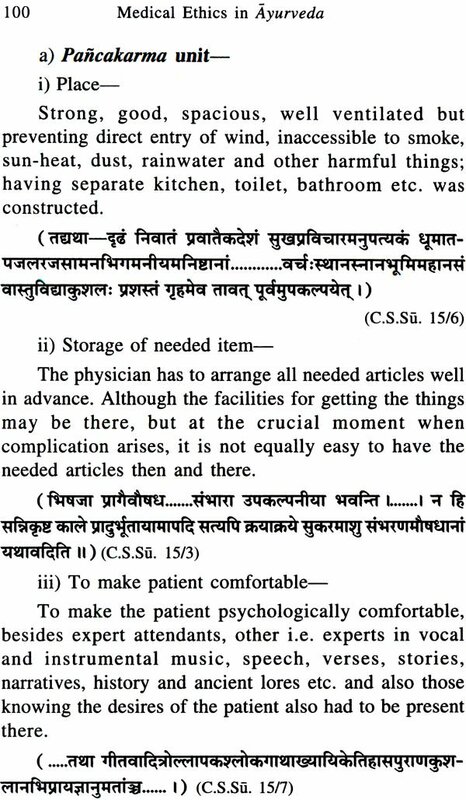 Points relevant to current medical ethics of modern medicine are mentioned in the appendix, in order to facilitate the reader to understand high standard medical ethics practised in golden era of ayurveda. It is hoped that the book will disseminate the knowledge of medical ethics as given in ayurveda and will prove to be beneficial to students teachers and also researchers. Dr. P. V. Tewari A. M. B.S., Ph.D., born to freedom fighters Shri Rama Shankar Tewari awarded Tamrapatra by late PM Smt. Indira Gandhi and Mrs. Rama Devi Tewari having lost her life during 42 movement; a throughout meritorious student has been serving ayurveda for the last 55 years in different capacities at SAC Lucknow and BHU. During her tenure at BHU served as Professor for 20 years, headed department of Prasiiti Tantra for 28 years, Dean Faculty of Ayurveda twice, Director WHO research centre and co- ordinator faculty of ayurveda and ayurvedic Pharmaceuticals. As a dedicated research worker has guided 53 D. Ay, MIMD Ay. and 21 Ph.D., thesis, published 258 scientific papers, a prolific writer has published 16 books, contributed 5 chapters and edited journals. She has also been associated with almost all important committees of universities and institutes of ayurveda and also Ministry of Health, Govt. of India. She has received many awards, citations and honours. Even at this age she is serving, gratis, suffering humanity as additional Medical Suptd. and senior consultant Mata Anandmayee Hospital, as vice President of Mata Anandmayee Kanyapeeth a gurukul for girls and serving Ma Saraswati through books. It is a great honour and pleasure to write a few words regarding the book 'Medical Ethics' in Ayurveda written by a versatile scholar Dr. Premwati Tewari, Ex-Head & Professor Department of Stri Roga and Prasiiti Tantra & Dean, Faculty of Ayurveda I.M.S., B.H.U. Varanasi. The book deals with the high morals laid down for medical profession and its allied branches long back when the modern science was at its childhood. Ayurveda is the science of life and the profession was sponsored not for livelihood but for removal of pain and disease not from only human being but from every being having life. Such high morals were only possible for a country like India only and can't be even dreamt by people of modern sciences. The present book is a great need at this time when in every field the high morals are neglected and man is only running after money and post. I hope it may be helpful for the humanity at large and bring back the high morals of Medical profession. The Sanskrit text is given for authentication and has been translated into easy English for modern scientist of this profession. Not only she has written this book but Dr. Tewari is still following the medical ethics and serving the poorest diseased day and night by adopting the profession through 'Anandamai Ma' hospital after retirement. I expect many more publications from such a great scholar of Ayurveda. The pace of scientific advancements in twentieth century has revolutionized basic thinking or approach in various aspects of normative behaviour, medicine being no exception. Though the scientists have controlled sizeable killer diseases/epidemics/endemics, yet nature mother has punished humanity for its unmindful and irrational exploitation by thrusting newer diseases, the remedy of those is yet in horizon. Confronting these challenges now for few decades the scientist are trying to peep into past to understand how in those days the persons lived more happily without these advanced facilities, how they protected their health and prevented or cured the disorders? Ayurveda is probably the oldest and well documented medical literature which has been serving the humanity from time immemorial and is continuing to do so even today. Due to it’s these potentials the scientists world over are now eagerly trying to understand or learn ayurveda. Dr. Nagraj G. Huilgol D.G.a. ; M.D. ; F.M.A.Sc. chief radiation oncologist Dr. Balabhai Naanavati Hospital Bombay, being confronted very often with ethical problems in his day-to-day work of dealing the cancer patients probably became inquisitive to know how medical ethics was dealt in ayurveda; and then passed on the query through Mr. Atul Tewari, his friend and my nephew to me. This was an impetus for me to work on the subject whom earlier I had never thought of; the present book is an outcome of that. The fabric of society in earlier days was much different from what we see to-day. It was a compact well-knit, patriarchal society governed by the king->head of the family, who use to care every citizen/member. Universally acceptable and beneficial social laws dominated every walk of life including medical practice. Teaching of ayurveda was not institutionalised, the vaidyas of high repute were teaching the disciples at their own set-up, it depended upon acceptability of disciple to the teacher and teacher to the disciple. In his hermitage the teacher beside teaching ayurveda always made attempts to model the disciple as a good, modest, honest, compassionate and humane vaidya. In such framework social and medical ethics, as-well-as other norms were so intricately interwoven that it becomes imperative to understand all even to know about one. The compartmentalization of subjects was also not very tight. Naturally to understand and appreciate medical ethics one has to study other subjects also, only then exact picture can be appreciated, which pattern is followed in the book. To appreciate different aspects of social and medical ethics it is to be understood under specific topics/headings accordingly the present book is divided in five chapters. Chapter one gives a very brief reference of modern medical ethics and social, as-well-as religious customs of Indian society protecting the dilemmas likely to be faced by a vaidya. Chapter two elaborates only those social norms/ ethics which modelled the personality of a disciple of ayurveda into a great physician. Various practices to prevent/protect ailment and improve health, specially of future generation are also included in this very chapter. Chapter three is devoted to the method of education relation of teacher and tought, oath by both, social behaviour of disciple and practical training of surgical or parasurgical procedures on various models. Permission to practice or registration was a prerequisite to practice. 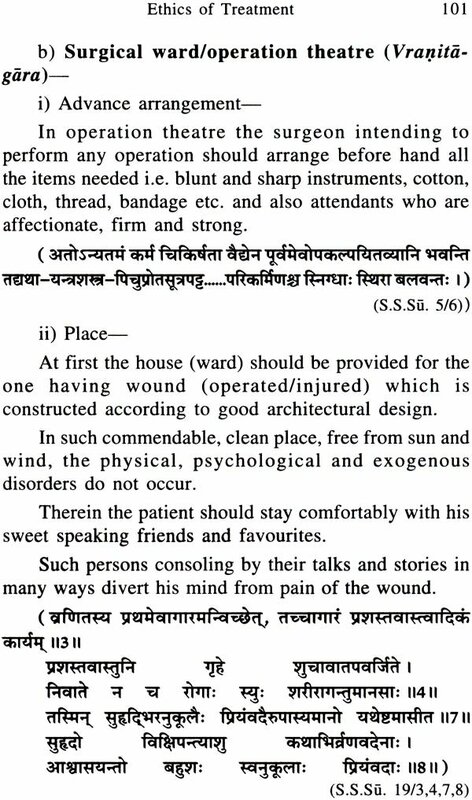 In chapter four the qualities of physician, surgeon, accoucheur/accoucheuse, patient's attendant, birth- attendant, nursery-attendant and wet-nurse indicative of their morale/character/ethics as-well-as specific ethics of v aidya (physician, surgeon and accoucheur/ accouscheuse), more-so behavior towards patients etc. are discussed. The fifth or last chapter deals with the ethics of treatment, which includes almost all aspects of treatment with most important indication that the treatment has to be wholistic but individualised, there cannot surgical ward/operation theatre, labour ward/ room, nursery etc. with disinfection and other arrangements are also included. At the end of every chapter its salient points are mentioned to facilitate the reader for understanding glimpse of points dealt in the chapter. Though some subject matter presented in the book does not fit in the ambit of medical ethics as practised to day, yet it is included to have an insight in the socio-medical ethics practised thousands years back in that era. In entire book English translation follows the quotations from books of ayurveda, but for few places where-in either quotation is very long or English translation is given point-wise. Where-ever short reference of subject is given and the text is not at all translated, there only references from important books of ayurveda have been cited. The subject matter of this book is discussed in almost all the classics of ayurveda albeit with difference of words or method of presentation. To avoid repetition, after recapitulating the matter from C.S. ; only additional or different matter from other books is included. Interpolation with own ideas or modem explanations has also been avoided, so that the reader can derive his own inferences without wasting time in searching the books; albeit at few places some explanations have been added in brackets. Widely admired 'Hippocratic oath' is given in appendix one; in appendix two important points of 'Medical ethics' and also 'Code of medical ethics' vis- a-vis points given in ayurveda are presented; Appendix three contains botanical names of the flora referred in the book. The book ends with index. In English translation internationally accepted diacritical marks are used. At all the places alphabetical order is based according to English language except in appendix and index wherein initial separation of a, a, s, s, s. only is done. At the outset I express my gratitude to Dr. Nagraj whose inquiry prompted me to write this small book. I bow respectfully to my departed teacher and mentor Prof. P.V. Sharma whose fatherly affection, guidance and encouragement gave me the courage to step into the field of academic writings and also to Bhau K.C. Chunekar an eminent scholar of Dravy aguna whose blessings, suggestions and encouragement made my path very smooth and pleasant to walk. I am grateful to Prof. Chunekar who inspite of his failing health wrote forewords of this book. To express gratitude to my departed senior erudites Prof. D.S. Gaur of basic principles and Prof. G.D. Singhal of paediatric surgery (both I.M.S.) would be undermining their contributions. Their book 'Surgical ethics in Ayurveda' has been torch bearer; I bow before both of them with reverence. I thank Dr. J.S. Tripathi reader Kayacikitsii faculty of ayurveda B .H. U. for very generously providing his article on medical ethics. Young, budding pediatricians of ayurveda Drs. P.S. Upadhyaya (Asst. Prof.) and Niraj Shrivastava ex. senior resident deserve special thanks for providing literature from library and internet, which is the backbone of this work. Warmth and affection of my elder sister Dr. (Mrs) Pushpawati Tewari and help, guidance and encouragement of my younger sister Dr. (Mrs) Asha kumari are of great support, I express gratitude to both these great personalities. Though my nephew Atul tewari has been instrumental for conveying the massage of Dr. Nagraj, yet I will not express gratitude as it was his duty. However, I thank all my children Atul, Alok-Anjali; Gopal-Anshu, Akshaya-Divya for moral support and encouragement and the youngest member master Achintya Mishra to give me impetus by his sweet voice. Young enterprising publishers Mr. Sunil and Ashokand Sushi! Guptas deserve applause for bringing the book in very short time. I will be highly obliged to learned scholars if they forgive me for shortcoming of present .work and give constructive suggestions for improving III future.